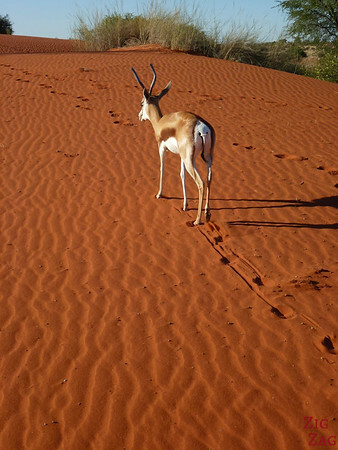 Before embarking of my first ever game drive, I had the opportunity to walk around our ranch in the Kalahari sand dunes with a springbok as my tour guide. 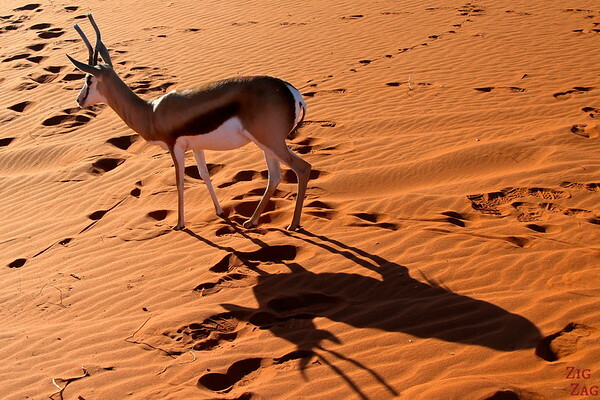 The Namib desert is more famous but the Kalahari has a lot of charm. 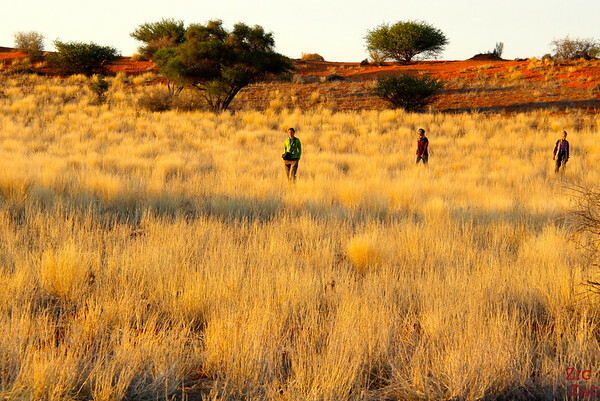 The Kalahari desert is a large semi-arid area coverding part of Botswana, Namibia, Zambia, Zimbabwe and South Africa. It is a semi-desert so it supports animals and plants. It has no permanent surface water. 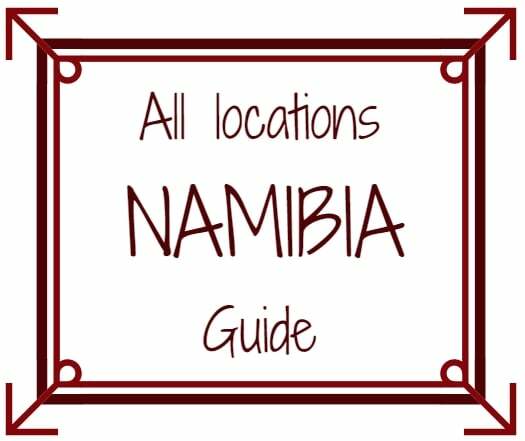 Animals that live in the region include lions, cheetah, leopards, hyenas, meerkats, giraffes, cwarthogs, jackals, baboons, and antelope​s. 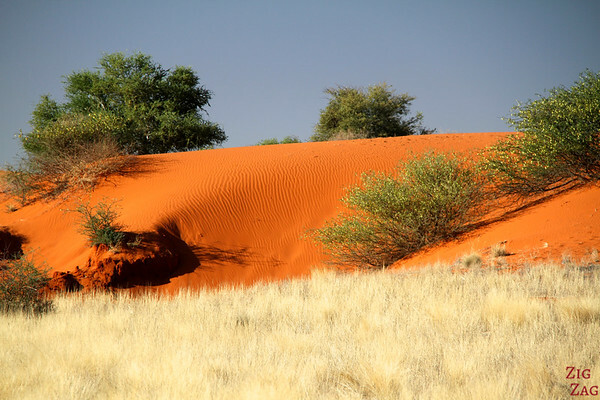 The Kalahari desert is a vast region, a drive through via road C20 for example will give you a good overview. 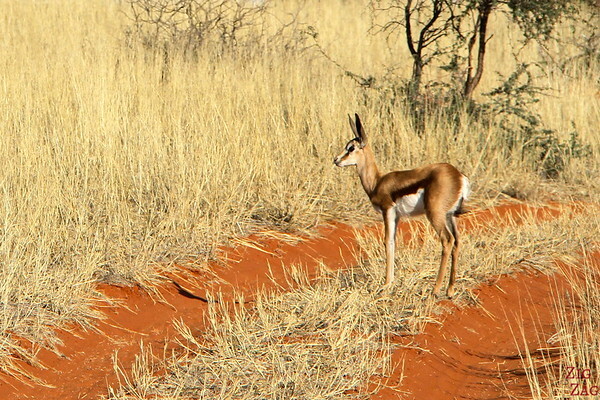 All of us on the group tour were amazed by the scenery of the Kalahari Desert as we approached it. It is so different from Sossusvlei! 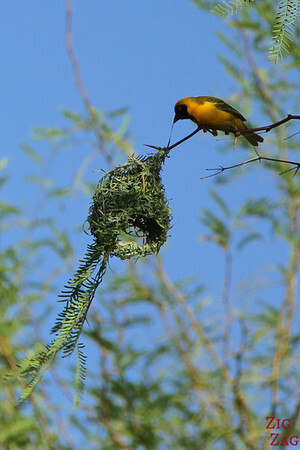 It is because it acutally is a semi-arid area with sandy savannah. ​It is quite flat with long longitudinal sand dunes. The sand is orange/red and some plants to strive in this area. 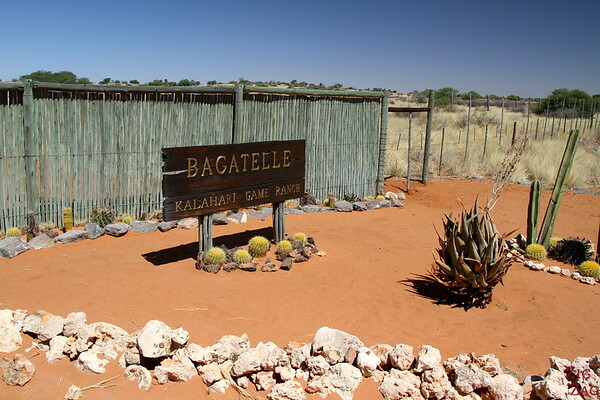 In the Kalahari desert, I stayed at the Bagatelle Game Ranch which is located in the wilderness North of Mariental. It had really nice facilities. I would not have minded staying longer, enjoying the isolation and doing some kind of retreat in connection with nature. After building the tent I went on a walk around the lodge with 3 others and we were the pet springbok deicded to be our tour guide. It did not leave small group until we reached one of the dunes which allowed us to observe its tracks. This was funny until he tried attacking one of us (apparently it does not like men). After diner, few others and I decided again to sleep outside our tents, even after seeing scorpions… Luckily nobody got bitten and I had a wonderful night. The place is so peaceful! And at sunrise several of us woke up early and went for a morning walk in search of Meerkats. 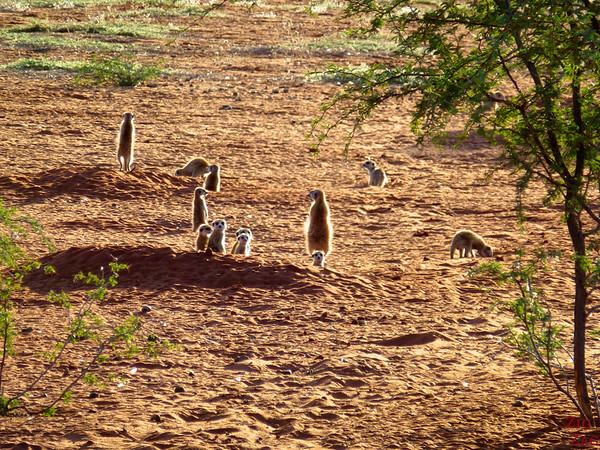 And we saw them: Meerkats!!!! 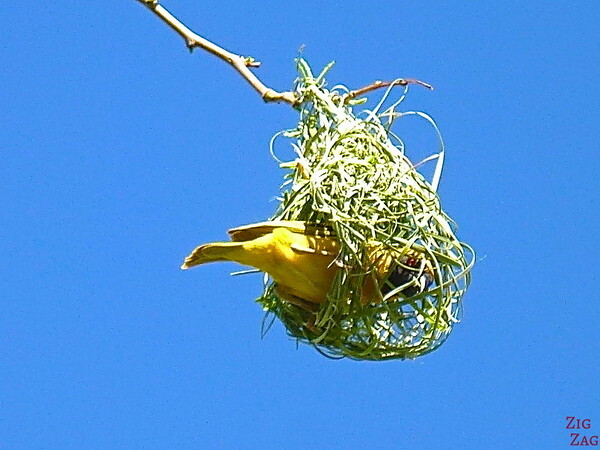 I was jumping and jumping, my smile reaching to my ears… best morning surprise ever! They are so much fun. We also spotted a beautiful antelope but tha's it. But not to worry, our next activity was a game drive during which we spotted a lot of animals. Do you love meerkats too?